Read before the Association of Medical Superintendents of American Institutions for the Insane, at Baltimore, Md. May, 1873. Utica : State Lunatic Asylum, 1874-75.
vol. xxxi., July, 1874 ; pp. 1-29, [6 l.] ; ill., 6 plates, 23 cm. Photographs : collotypes, 14 photomicrographs on 6 leaves. Subject : Brain — Histopathology. Three hundred pounds in girth and a giant in reputation, John Perdue Gray shaped the narrative of nineteenth century psychiatry through his position as director of the Utica State Lunatic Asylum and as editor of the American Journal of Insanity, the official organ for the politically influential lobby of Association of Medical Superintendents (AMSAII) which he helped to establish in 1844. Gray wrote or directed many of the editorials that appeared anonymously in the Journal, including several scabrous attacks against a group of neurologists, led by John Hammond, who were maneuvering for some of the institutional power enjoyed by the asylum directors and their cohorts. This struggle for political influence led to the organization of the American Neurological Association which John Hammond co-founded in 1874. The conflict between Hammond and Gray turned slanderous during the late 1870's, culminating in the opposing medical testimony the two physicians provided during the trial of Charles Guiteau, assassin of President James Garfield. Politically astute, Doctor Gray took the side of the public's outrage and testifed that Guiteau was sane and fit for hanging. Gray prevailed over Hammond's view that Guiteau was insane and should be shown mercy, but Hammond was vindicated when an autopsic examination revealed a syphilitic infection in Guiteau's brain. This must have been a sharp embarrassment for Gray who was foremost among superintendents to advocate for the humane treatment of the mentally ill based on medical science and the disease theory of insanity. He actively promoted the sectioning and microscopical examination of the brains of lunatics who died under institutional care, many of them mad as Guiteau with the ravages of neurosyphilitic lesions. 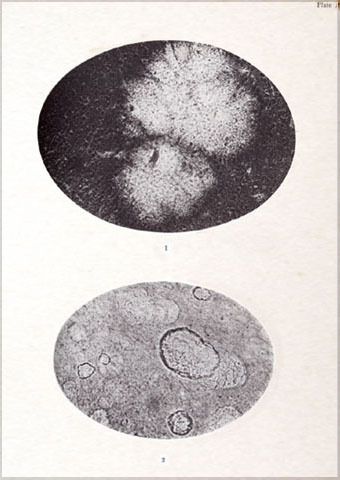 A fact which seems of the utmost importance is the similarity of histological changes attending the different forms of insanity, as represented in the photo-micrographs, and, indeed in all cases which have fallen under observation. If such regularity is displayed in future investigations, as I am strongly led to believe will be the case, this fact will practically confirm the principle, that in insanity we have to contend with only one diathesis, manifesting itself under different phases in its progress and results. — page 12.